On Sale with Free Insured Shipping! Unlike an ordinary exerciser with just a speedometer, Airdynes have measured workload meters, which give you exact, measured, repeatable workload readings. This enables you to keep track of your progress from day-to-day and week-to-week. By monitoring your workload level and time for each exercise session, you can actually "see" your fitness level improve with regular workouts. 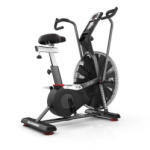 Click on the Airdyne photos or links below for detailed specs, prices and ordering information for each model. Optional Airdyne reading stand, windscreen, pulsemeter, and gel seat pad are on sale now. Privacy Information: We never give out your personal information, purchase or email address to anybody. Period!